LSBU won this esteemed award for its 'City Opportunities' programme, a scheme which hopes to transform the futures of young adults who have spent their childhood in care. Through this week-long programme, which was developed in collaboration with the City of London Economic Development Office, care leavers between the ages 16 to 24 attend a number of workshops, including mentoring, careers advice, problem solving and decision making challenges, goal setting sessions, and CV and interview skills. The programme also includes visits to City firms such as UBS and Lloyds of London, and participants benefit from sessions with staff from these distinguished organisations who encourage them to realise that higher education and professional careers are within their reach, providing them with a tool box of transferable skills. The participants are also able to sample university first-hand, attending taster lectures and seminars at LSBU's Southwark campus. The scheme has gone from strength to strength since its pilot in 2010, and a number of new and renowned organisations have signed up to the second phase of this year's scheme, including insurance brokers JLT, the City recruitment firm Fairplace Cedar and the City HR Association. 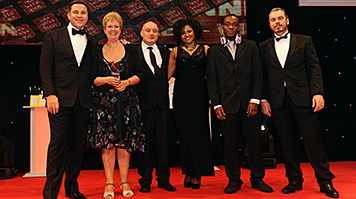 LSBU's victory was witnessed by more than 1,000 people, who gathered at the Grosvenor House Hotel, Park Lane. The judges commended LSBU's scheme for its "clear evidence of sustained commitment and success in developing the aspirations of children who had recently left care". Commenting on the win, Lynn Grimes, Director of Marketing and UK Student Recruitment at LSBU, said: "We are very proud to have won the award for 'Widening Participation Initiative of the Year' at this year's Times Higher Education Awards. "The scheme run by LSBU is different and innovative because it introduces people from one of the most marginalised groups in our society into the corridors of power and privilege - the City of London." Mark Ellis, Senior Manager, Schools and Partnerships at LSBU, said: "I'm delighted that the panel acknowledged the importance of a project that focuses on tackling the deplorable underrepresentation in higher education of young people who have experienced local authority care. "The City of London is a major provider of graduate jobs and we wanted to ensure that care leavers who have grown up nearby get a share in the opportunities that it provides. "We have had fantastic response from the young people who have taken part in the scheme since 2010, and it is an honour for it to now be recognised as representative of the best in the higher education sector." Mark Boleat, Chairman of Policy and Resources Committee of the City of London said: "Only five per cent of 18-year-old care-leavers go on to complete a degree, compared to 40 per cent of the general UK population. "All young people, whatever their background, deserve the opportunity to flourish and pursue whatever career they desire. Projects like this are vital in helping them to access the advice and support that would be naturally available to those with a family support network. "This is why the City of London Corporation funds a range of programmes that promote social mobility and encourage residents of our neighbouring boroughs to consider a career in the City of London. We offer LSBU our sincerest congratulations in winning this award." London South Bank University (LSBU) has been instrumental in encouraging non-traditional learners to consider higher education and breaking generational cycles of deprivation since its foundation in 1892.